Open Sibelius, and switch to your new Playback Configuration named "NotePerformer". Sibelius must remain configured to use one of these paths for plug-ins. The folder must also exist on your hard drive, prior to installing NotePerformer. 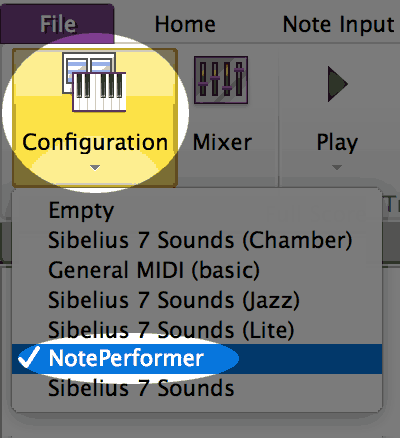 To get NotePerformer playback in Sibelius, switch to the NotePerformer configuration. This configuration should appear automatically if you've installed NotePerformer. NotePerformer's instruments respond to reverb, pan and volume from the Sibelius mixer. Mixer settings are saved with your score. By default, reverb is 39%, while pan and volume may vary. This variation in default volume was meant to counteract imbalances in Sibelius 6's built-in sounds but now often produces unwanted volume differences between instruments. Make a habit of always checking the volume levels, as you want your instruments to all have the same volume. Double-clicking a volume slider resets it to the baseline value of 95. You can also use our included plug-in to reset all instruments to a volume of 95. Run this script when starting a new score, or when adding staves. This script also resets pan to the staff's default. 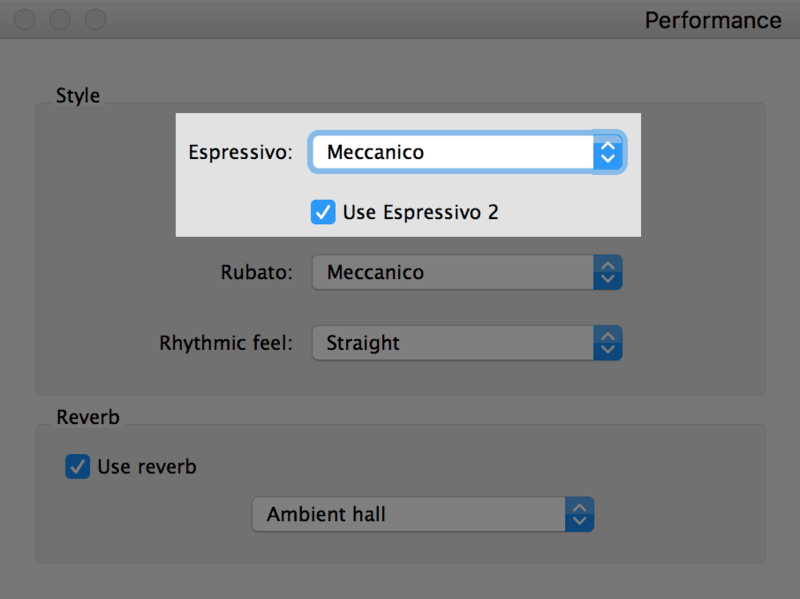 If you want Sibelius to strictly follow the dynamics in your score you must lower the espressivo setting to meccanico from the performance dialog. The "espressivo" feature makes Sibelius humanize the dynamics, for better or worse. Use only with care. 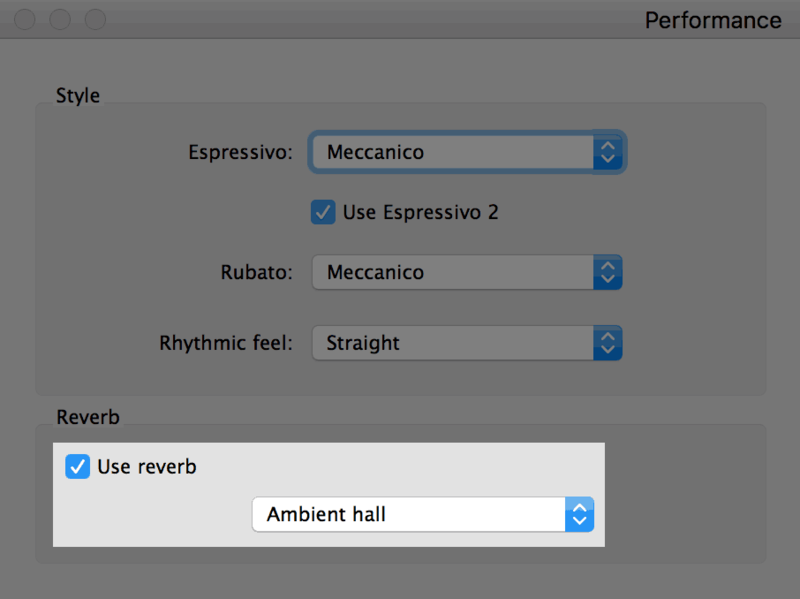 If you experience problems with higher notes being louder than lower pitched notes during a melody, you are using Espressivo. You can also change our global reverb level from the performance dialog. This is done by changing from Ambient hall to another room type. The "Use reverb" checkbox must always be selected. You can turn off the reverb by using the "Dry" room type. You can have early reflections only by using "Small room". The room type setting works in combination with the reverb sliders in the mixer (which have a baseline value of 39%). You can turn off playback for any item in Sibelius. This is done by deselecting "Play on pass" from the Inspector dialog. You can use this feature to correct improper playback in Sibelius, such as nested slurs. You can also combine this feature with hidden items (such as hidden slurs or accents) to improve playback for scarce or unconventional notation. Occasionally when opening an older orchestral score created with Sibelius Sounds, the first plug-in instance is -6 dB lower than it should be. The result is that the first 16 staves are considerably lower in volume. This is a problem if your score uses more than 16 staves. Double-click this slider in the mixer to reset the volume for the first plug-in instance. 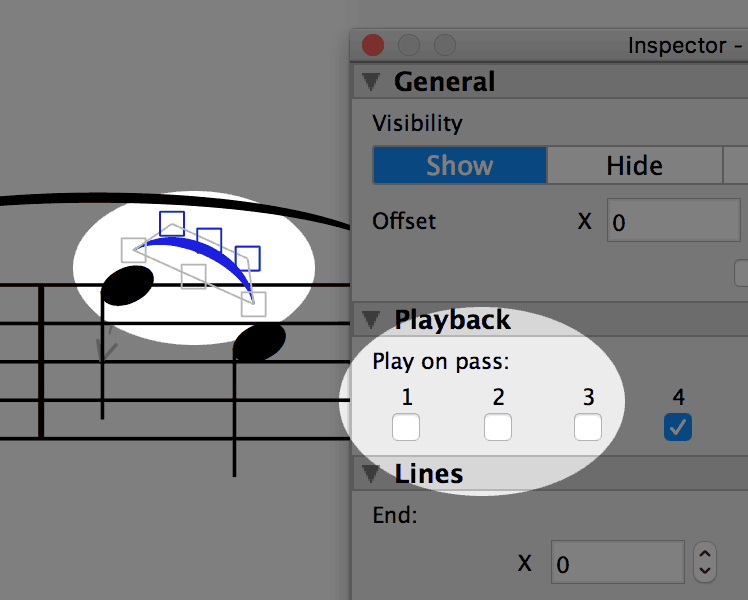 You can customize playback of individual trills in Sibelius, from the Inspector. Speed means number of notes per second and is useful for fine-tuning playback of a trill. Unpitched percussion trills in Sibelius occasionally play the wrong sound for every other note. This happens when Sibelius incorrectly performs it as an interval trill within the percussion map rather than a tremolo. Problem is solved by setting the "fixed" trill type with an interval of zero half steps. Trill lines are automatically performed legato—when using NotePerformer—but trill symbols aren't because they are missing the appropriate Sound ID change. Problem is solved by manually adding the +trill Sound ID change to the symbols in the Dictionary. Scores using an old House Style may be missing Sound ID changes for articulations such as tenuto and marcato. Without a Sound ID change, the articulation will not playback correctly. Problem is solved by manually adding Sound ID changes named after the articulation. Or alternatively, by importing an up-to-date House Style. 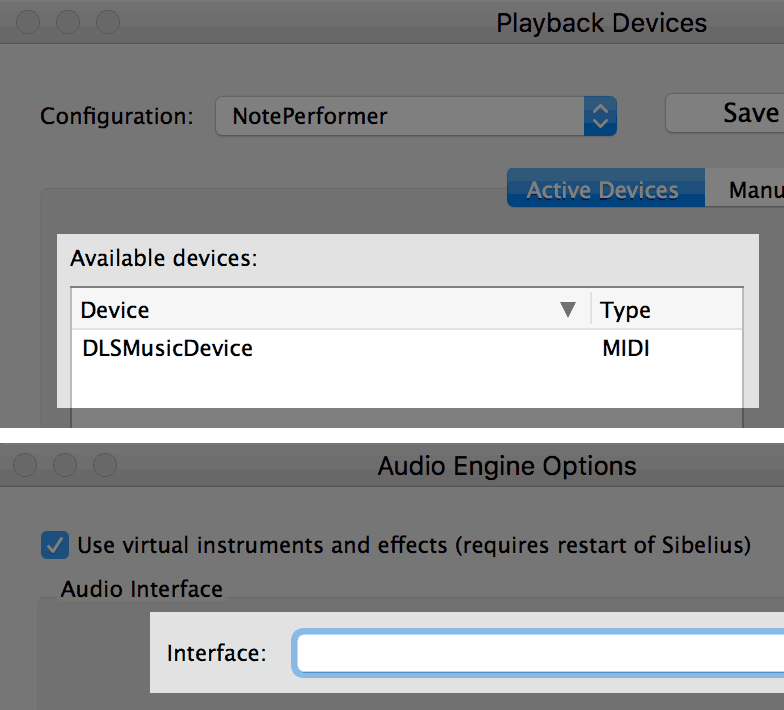 If you see only "MIDI" type playback devices in Sibelius, you may not have an audio interface configured. In this state only General MIDI playback works. Problem is solved by opening the Audio Engine Options dialog and selecting an audio interface. Sounds in NotePerformer that lack a staff definition in Sibelius may be accessed by overriding the sound from the mixer. If you manually override a sound from the mixer then Sibelius also overrides the device—whether you like it or not—by assigning it to the first NotePerformer instance (N. 1-16). This is a common source of error with larger scores using sound overrides. You should immediately change the device to "auto" after a manual sound override, or you may start experiencing problems with the wrong sounds being assigned. Dynamics should include voice 1 when possible. 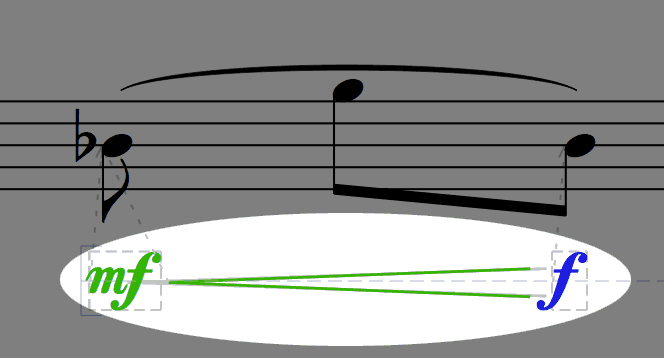 Dynamics or hairpins in the wrong voice is a common source of error with Sibelius playback of dynamics. If you want to mix sounds from different plug-ins you add these additional plug-ins to the NotePerformer playback configuration. This is done from the Playback Devices dialog. You select the plug-in you want to add under available devices and click activate. Save the configuration using a different name. The NotePerformer configuration reverts to its original state on a regular basis. With a mixed configuration—like this one—you must manually specify the playback device for each staff, from the mixer. The advanced user can instead use Playback Devices &rtrif; Preferred Sounds to specify how sounds should be distributed over different devices. 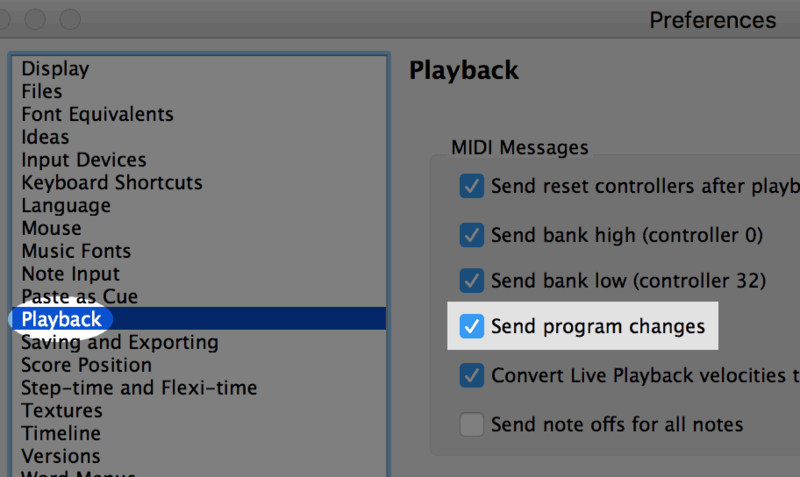 If sounds are not assigned correctly (or always playback as a trumpet sound) you may have inadvertently deselected Send program changes in Sibelius's playback preferences. 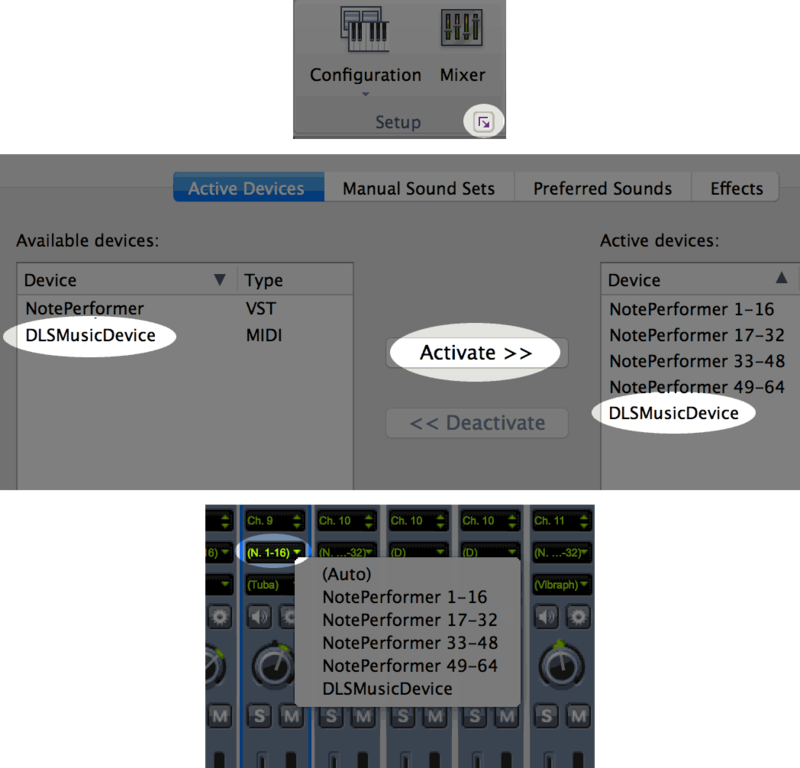 NotePerformer relies on bank and program MIDI messages, so you must not deactivate these features. 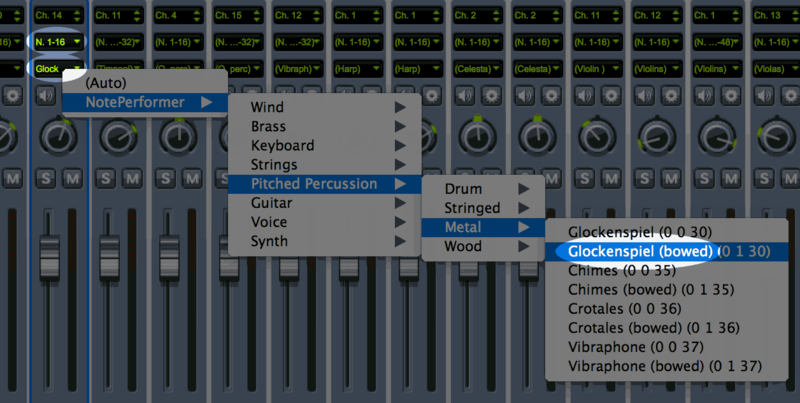 Our Plug-Ins for Sibelius unlock additional features. The Orchestral Tuning Plug-In adds support for tunings other than 440 Hz. The Pipe Organ Stops Plug-In provides easy access to custom registration. The Tenuto Always Plug-In forces all notes to be performed for their full written length, overriding natural interpretation. The Vibrato Amount/Speed Plug-Ins provide in-depth control over vibrato. The a2, a3, ... Plug-In creates sections for woodwinds or brass, and reduces the sizes of string sections. We include a range of percussion sounds with no natural mapping in Sibelius, such as the Suspended Cymbal and Opera Gongs. These must be manually mapped to a percussion staff of your choice, if you wish to use them. 1. Add a percussion staff with the right appearance. 2. Select a full bar on that staff, and click the small arrow next to Instruments on the ribbon to open the Edit Instruments dialog. 5. 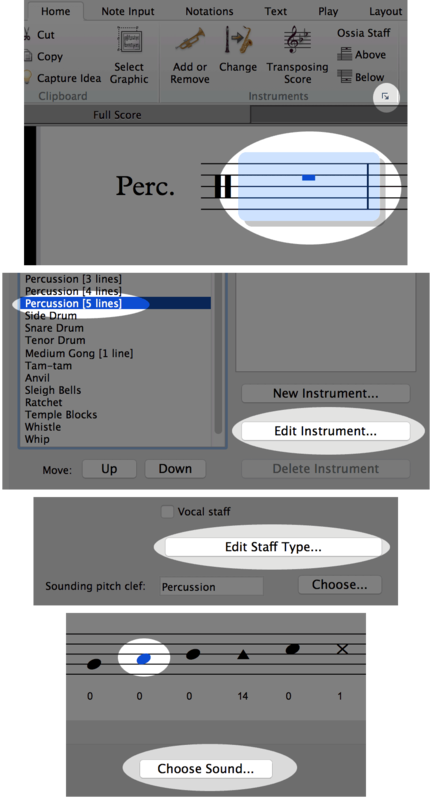 From the Edit Staff Type dialog you may manually assign percussion sounds to any notehead or pitch of your choice. 6. Close all dialogs and save your changes when prompted. Your customised percussion staff is now ready to be used. Videos may be out of sync in Sibelius due to NotePerformer's one-second latency. 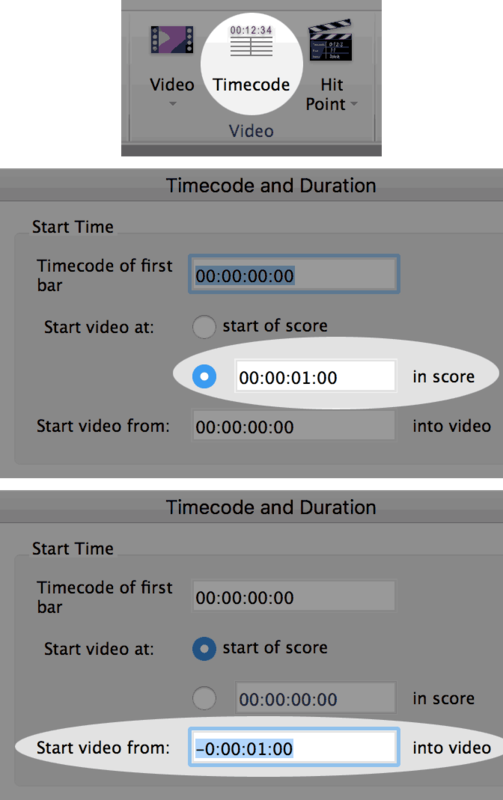 This is easily corrected for by opening the Timecode and Duration dialog, and starting the video one second into the score. Alternatively, you can start the video from a negative offset. By setting the video to start from minus one‑seconds into the video. Prior to Sibelius 2019.4, you cannot do Live Recording with NotePerformer as your playback device, due to latency compensation issues. The workaround is to temporarily switch to General MIDI playback when you wish to do live recording. You cannot use Rewire with NotePerformer in Sibelius, due to latency compensation/timing issues.